39 William Street. Google maps. Currently, a visitors centre for nearby Boags Brewery. 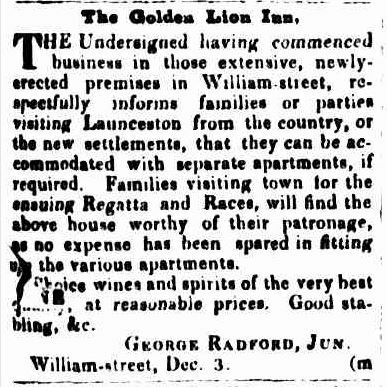 *I’m not sure if the Lame Dog became the Golden Lion, but in October 1833 Radford gives his address at “Lame Dog, William Street” and two months later, he’s granted a licence for the Golden Lion, so even if he constructed a new building to be the Lion, there is a continuity of ownership. I should like as briefly as possible to point out where Mr. Whitfeld is at sea re public houses. 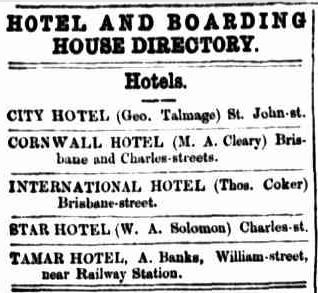 In the first place he says the Tamar Hotel was at one time the Sawyers’ Arms. Now, Sir, a man named Radford, who had been a soldier, built this house, obtained a license, and named it the Golden Lion. I am quite sure it was not at any time the Sawyers’ Arms. The two-story building opposite the Park gates, with a verandah top and bottom, was the Sawyers’ Arms, kept by Antoni Martini. In the year 1842 he let it to a man named Clark, who was a leading cricketer in those days; and he removed the license to the Royal Oak, corner of Brisbane and Tamar streets. George Radford, Jun , applied for a transfer of the Golden Lion from his father. The application was refused, the bench being of opinion that the applicant was too young to conduct such a house, and expressed an objection to any single person receiving a license. FIRE. — On Sunday night last a fire broke out in a stable belonging to Mr. Radford at the back of the Golden Lion in William St. Two men were sleeping in the stable at the time but it is not known how the fire originated. There were also three horses in the stalls and it was by the noise they made that the attention of persons in the neighbourhood was first drawn to the spot. The door was fastened inside but the men were either from fright or suffocation unable to open it. On its being broken open from without the fire burst out in flames which quickly enveloped the whole building there being upwards of two tons of hay in the loft. Happily the stable was detached and the wind favourable or some houses near must have been destroyed. One of the men was dragged from under the manger partially injured by the fire. One horse was burned to death and another considerably injured and about 10,000 shingles which were laid near the stable were consumed. George Radford, Golden Lion.–Excellent house, well furnished. Carried unanimously. RADFORD’S INSOLVENCY. -This case has got into the Police-office. 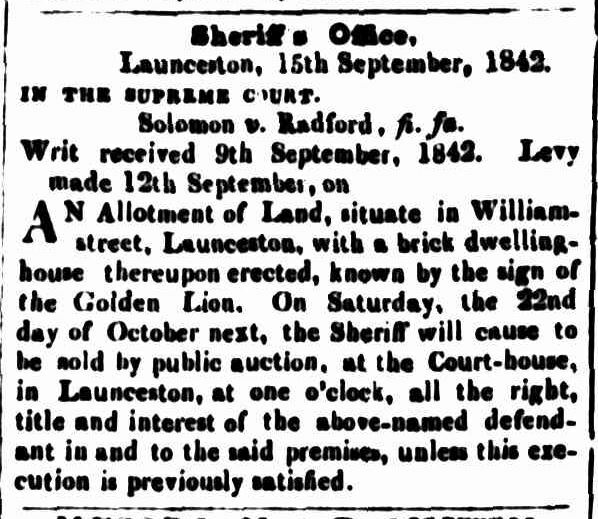 Mr. Atkinson, as assignee, placed a bailiff in possession of the premises known as the Golden Lion, occupied by Radford; the bailiff was forcibly ejected, and the assignee proceeds under the Insolvent Act against the insolvent, his wife, and daughter, for a misdemeanour, in obstructing him in his duty. The three parties were placed at the bar this morning, and Mr. Montagu defends them. The case has not yet terminated. Radford’s tenancy or occupation of the licensed premises, being worth a consideration, vests in the assignee, although the property may be made over, to his wife and children, and upon this principle Mr. Atkinson took, and still maintains possession. George Radford, “Golden Lion.”–Mr. Tarleton would mention that it had been reported to him by Mr. Fawns, that riotous proceedings were of frequent and almost nightly occurrence at this house; but he had made enquiry, and must confess he could not ascertain that such was the fact. The statement of a constable who resided opposite for two years, was that he had only known one noisy scene in the last five months. Mr. D. C. Davis reported that he frequently visited the house, and always found it correct. Mrs. Bell, who resided in the neighbourhood, had no complaint to make and another neighbour said he had no complaint whatever. When visited by the C. D. Constable, Mr. Radford was under the influence of liquor : to this he would add that some quarrel had taken place, he believed, between Mr. Fawns and the applicant about business matters, the latter having declined to take any more of his ale, or something of that kind. He did not find that the circumstances justified any opposition. Mr. Cameron said he passed every day, and found the house very quiet, Mr. Fawns was called, but was not in attendance. The license was granted, with a caution to the applicant to keep himself sober. Mrs. Jane Clark, widow of the late Nicholas Clark, was empowered to continue the business at thee Wilmot Arms, corner of Brisbane and Wellington streets. A like permission given to Mrs. Radford, widow of the late George Radford, for the Golden Lion, William-street. John Bowater, Golden Lion, William-street. The Police Magistrate said some complaints had reached him respecting this house, but he was able to say that great improvement had taken place, and now he had no objection to make. Dr. Casey said there was very excellent accommodation at the house. The license was then granted. 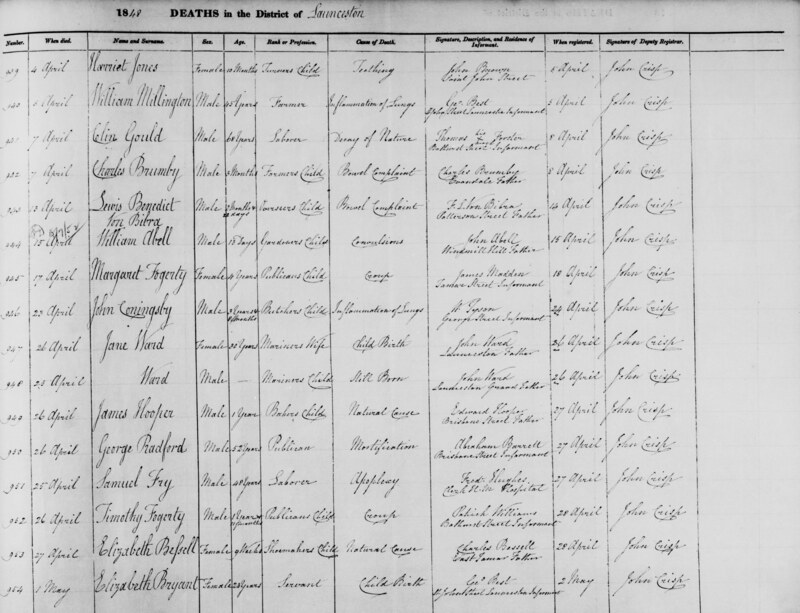 Thomas Flude applied for a license for “The Golden Lion,” William-street. The Police Magistrate said there was a great objection to increasing the number of public-houses. In the present case there was no objection against the, applicant, who bore a good character, and the house, which had formerly been licensed, was suitable, but within 100 yards of it there was the Dorset Hotel, a house equally good, and where all necessary accommodation could be procured. It was a very bad neighborhood, but had been very quiet since “The Golden Lion” was shut up. There was no necessity for its being re-opened. Mr. R. W. Butler appeared in support of the application. He urged that the applicant was a man of excellent character, and the premises were good. 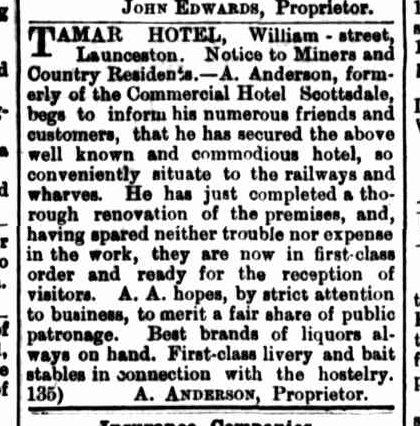 The house would not be so much a drinking house as an hotel; not so complete as the Launceston or Cornwall Hotels, but a good second class hotel, which would afford greater accommodation to persons arriving here. 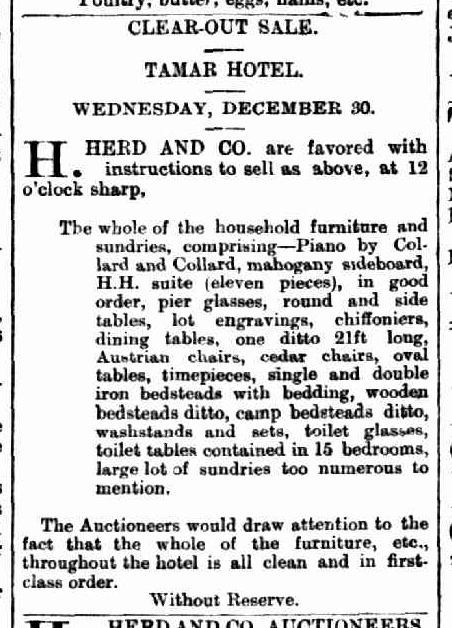 The house which had been lot to Mr. Flude at a low rental, was not adapted for any other business. Mr. Butler contended that the public houses were not so numerous in this neighborhood as in some other localities. The Chairman said it was to be regretted that the application had, not been made at an annual meeting, when a large number of magistrates would be present to give an opinion as to whether the house was necessary; for that was the only question, inasmuch as the premise were suitable, and there was no objection to the applicant. He would suggest that the application should be withdrawn for the present, and made at the annual meeting. Captain Reid was sorry to differ from the Police Magistrate as to the necessity for this house, though no doubt the Police Magistrate was better able to give an opinion on the subject that he (Captain Reid) was. 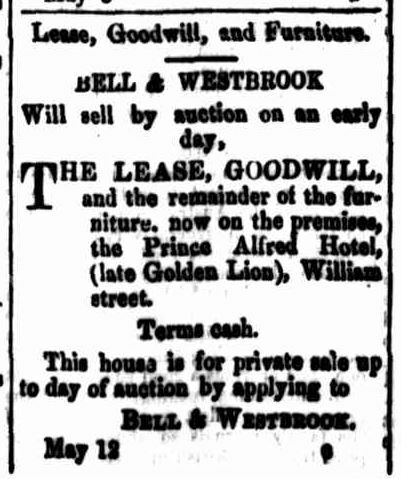 Neither the house nor the applicant could be objected to, and it must not be forgotten that two licenses houses at no great distance from the “Golden Lion” had been discontinued. He referred to the Ship Inn which was burnt down and the Ferry House at the Bridge. The Police Magistrate remarked that the “Golden Lion” had been built since the Ship Inn was burnt down. Mr Turnbull thought the application should have been supported by some expression of opinion by the residents in the locality. In the absence of that he was of the same opinion at the Police Magistrate. Unless the necessity for the license was shown by an increase of population or trade, it was not fair to grant the application when other licensed victuallers were struggling hard to pay their way. The Police Magistrate said it was sometimes a painful duty to oppose these applications but he was bound to perform his duty both to the licensed victuallers and the public. Formerly there was a large amount of business done in this locality. Reibey’s Wharf was formerly filled with vessels, but now there was not one there. 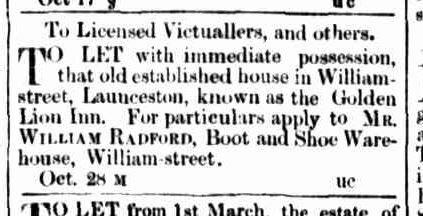 He had already told the applicant his opinion; and he (Mr. Gunn) thought he was foolish to press his application, for he could only hold the license for five months, and for that privilege he would have to pay the full license fee, and that was for a house where there was not sufficient trade before to keep it open. Mr. Butler then asked and obtained permission to withdraw the application. 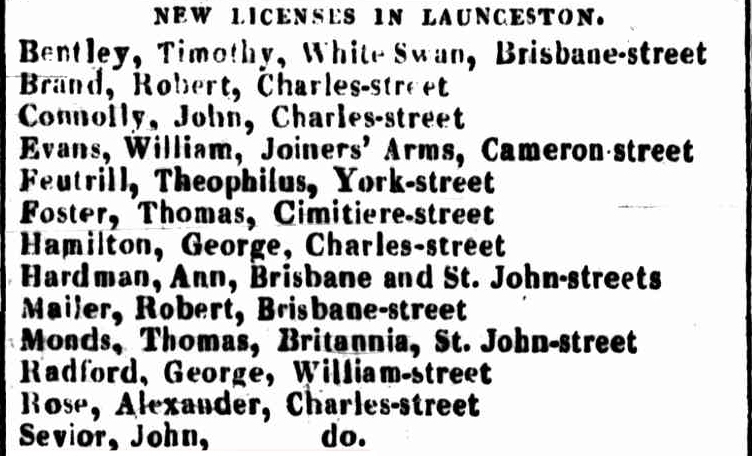 APPLICATIONS FOR NEW LICENCES (LAUNCESTON). Thomas Flude, Golden Lion, William-street. There was no objection whatever against either the applicant or the premises, but by a majority of votes the application was refused on the ground that there was no necessity for another public house in that locality. The next business was the hearing of an appeal by Thomas Flude, against the refusal of the last annual licensing meeting, to grant him a public house license for the premises In William-street, known as the “Golden Lion.” –Mr. C. A. W. Rocher appeared in support of the appeal-The Police Magistrate again objected to the license being granted on the ground that there was no necessity for the house. –The Mayor spoke in favor of the application. He could not understand wily it should be objected to. He contended that it was not the province of the Bench to determine on the necessity of a house. All they had to do was to see that the houses were adapted for the purpose, and that the applicants were men of good character. In this case both the man and the house were unexceptionable. The property was not fit for anything else. As licensed premises it was worth £2000, but without a licence it was not worth £200,–It was then only a mass of bricks and mortar. Under all these circumstances he thought wrong would be done by withholding a licence.–Mr. Weedon spoke in similar terms. The licence was then granted by a majority of votes. Permission to sell Liquors.-J. 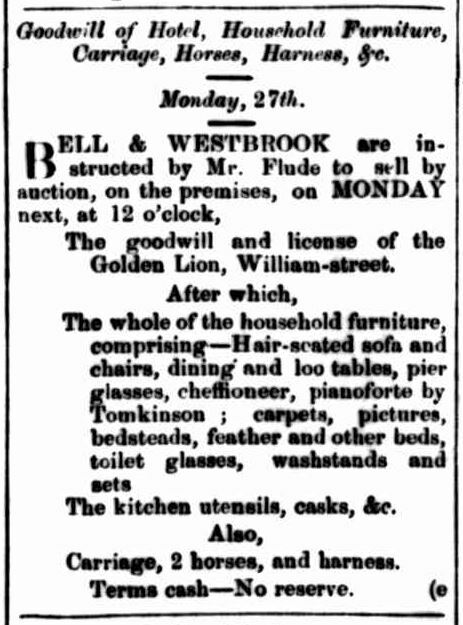 F. Hobkirk, Official Assignee of Insolvent Estates, was granted permission to sell liquors by his deputy Robert Pearson, under the license held by Thomas Flude, insolvent, at the ” Golden Lion,” William-street. The Golden Lion Inn.–Mr Fredk. 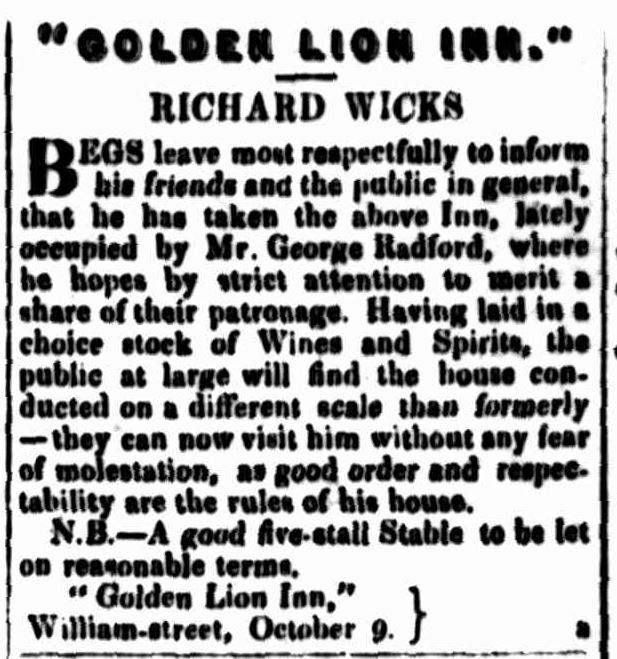 Jones has taken the Golden Lion inn, William-street, and has obtained authority to sell liquors until next transfer day. 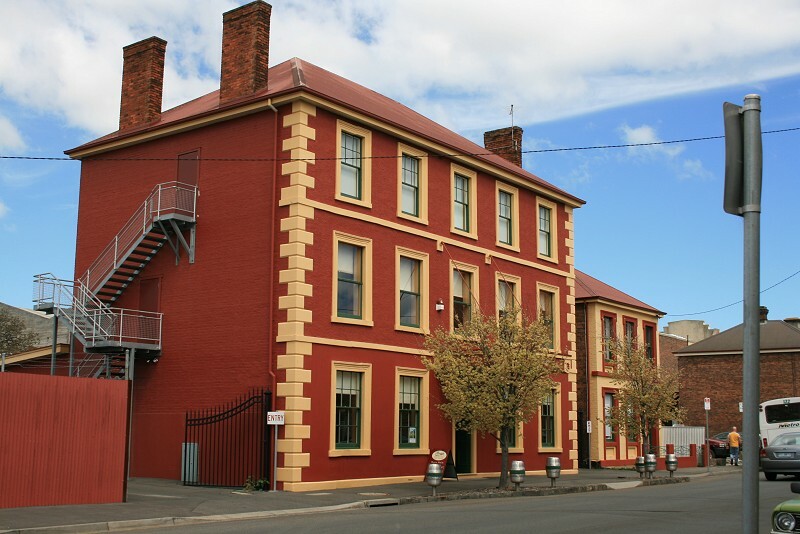 At the quarterly licensing meeting held here on Monday week, a very peculiar decision-so directly opposed to another at Hobart Town –was arrived at, as to be worthy of special notice. 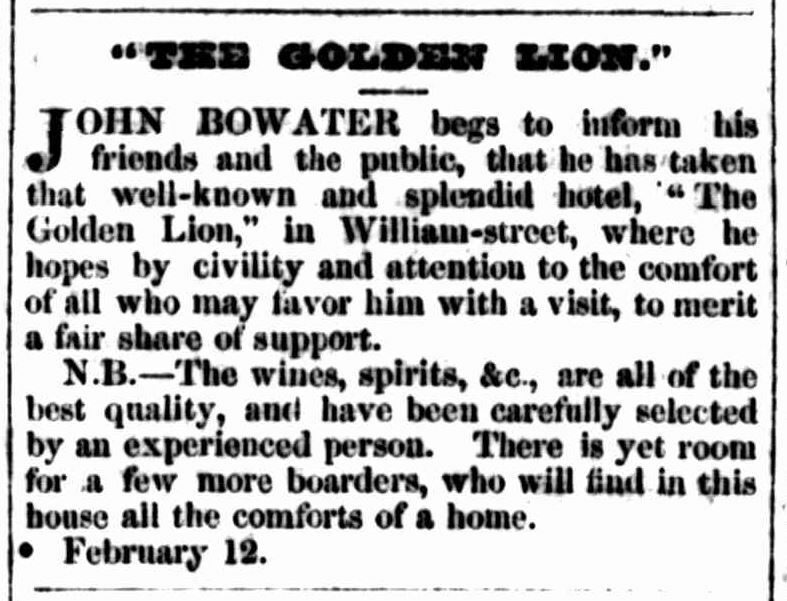 The holder of the annual license for the “Golden Lion,” one of the largest inns in town, became insolvent. The assignee sold the license from the 1st July to the end of the year to Mr Frederick Jones, who believed that he had thus obtained a legal right in the license, as at a Court of Petty Sessions the presiding justices granted him permission to sell. In consequence of this he did not consider it necessary to apply to the quarterly licensing bench, and his application was handed in one day too late. At the quarterly licensing meeting this omission was pointed out by the Police Magistrate who said the object the framers of the Licensing Act had in view in demanding fourteen days’ notice, was to afford time to make enquiry as to the character of the applicant.” But in the case of Mr Jones such notice was entirely unnecessary, as he was known to the licensing bench as the holder of a license for some thirty years, and they had no objection to raise to him on the ground of character, nor as to the suitability of the premises, which are unexceptionable, and situated where additional accommodation is necessary–nearly opposite the offices of the railway contractors’, and in the vicinity of the Launceston terminus. 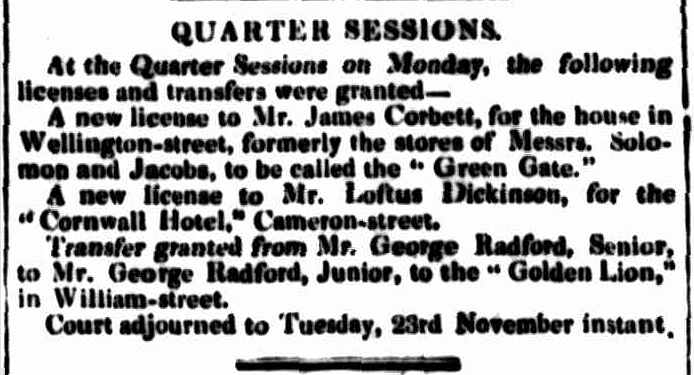 Frederick Jones was granted permission to sell liquor under the license held by James Jordan for the Union Inn, George street, until the next quarterly licensing meeting, and Arthur Jones under the license held by Frederick Jones for the Prince Alfred Hotel, William street. William Fisher, was granted permission to continue to sell liquors until the next quarterly licensing meeting, under the license held by Frederick Jones, for the “Prince Alfred Hotel.” The permission to Arthur Jones, for the same purpose on the 11th inst, being now cancelled. -Mr Robert Miller applied on Monday, before Thos. Mason, Esq., P.M., and Alfred Harrap, Esq., at the Police Office, for permission to sell liquors in the Prince Alfred Hotel, William-street, under the license held by Mr Wm. Fisherr, until the next quarterly licensing meeting. Permission was at once granted. sell liquor under the licence held by Robert Miller, at the Prince Alfred Hotel, William. street, Launceston, until the next quarterly licensing meeting. Permission to Sell Liquors.—Abraham Banks was granted permission to continue to sell liquors until the next Annual Licensing Meeting under the license held by Medmer Lushington Goodwin, in respect of the house in William-street known as the Prince Alfred Hotel. Abraham Banks. 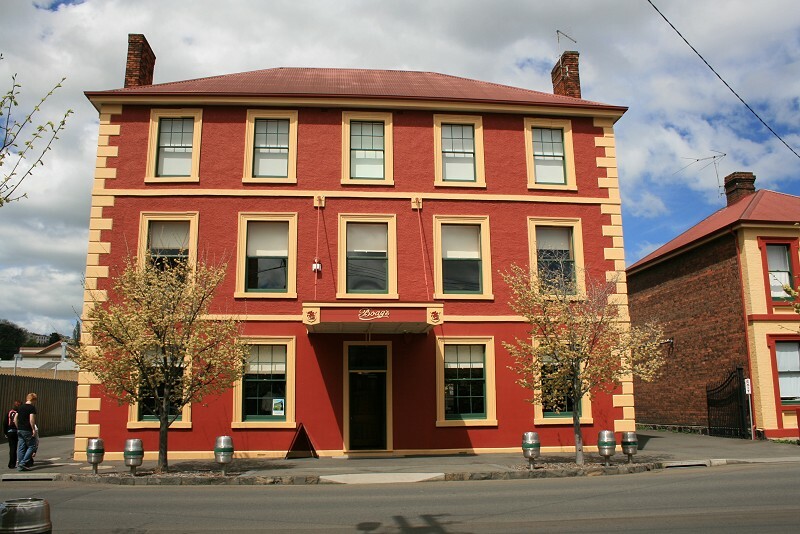 Tamar Hotel (formerly Prince Albert Hotel), William-street. The Mayor said this was a spacious good house, and it, had been immensely improved by Mr and Mrs Banks. 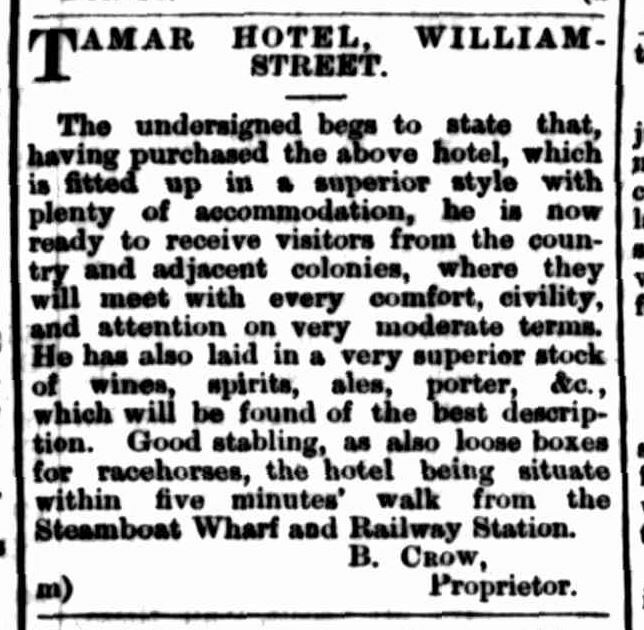 THE “TAMAR HOTEL.”—These extensive and commodious premises in William-street, formerly known as the Golden Lion, have been purchased by Mr B. Crow, who intimates that he has had them thoroughly renovated and fitted up in a superior style. The situation is unquestionably convenient, being within two or three minutes’ walk of the steam boat wharf on the one hand and the railway station on the other. 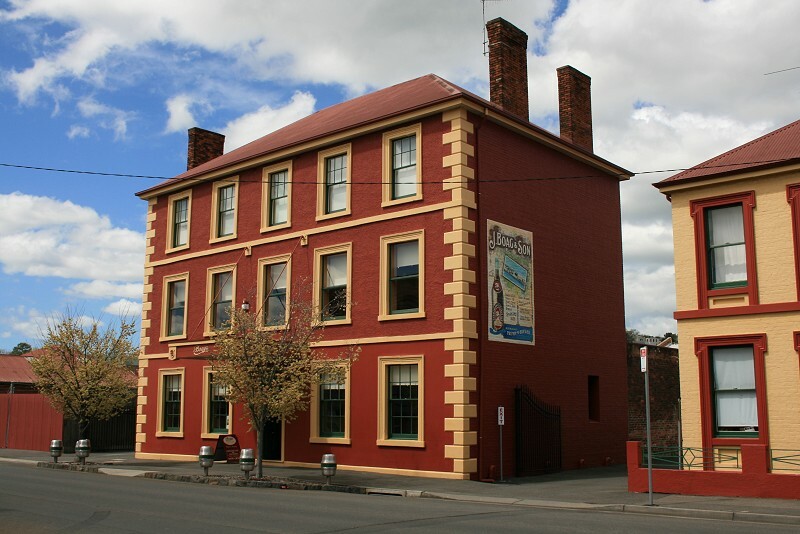 About 6 o’clock this morning an alarm of fire was raised, the cause of which turned out to be that the roof of the Tamar Hotel, in William-street, had caught fire from a spark from a chimney. The alarm was quickly given. Fortunately some members of the Fire Brigade, who happened to live in the vicinity, were quickly on the spot, and with their assistance the reel kept at the Customs Bond, and the men employed litre , the water was got on, and the lames extinguished before the arrival of be Main Brigade, and before any material damage was done; only a small portion of thereof having suffered. Mr Edward Holehan, licensee of, the Tamar Hotel, narrowly escaped losing his license on 30th ult. He pleaded guilty at the police court to an information laid under section 92 of Act 53 Vic, No. 37, charging him with allowing implements, to wit cards; to be used in his house at four o’clock on the morning of the 18th ult. This was the third offence which he had committed within 12 months, and the bench in such cases has power to suspend for a term, or forfeit, the license held by any person who has so offended. Mr Coulter, however, who had charge of the prosecution, asked the magistrates, Messrs G. W. Waterhouse, J. W. Campbell, and E. Whitfeld, to inflict a penalty which would act as a deterrent to others, but at the same time he urged that justice should be tempered with mercy, as it was not, he thought, a wilful act of breaking the law that Mr Holehan had committed, but one which probably merely exhibited his want of firmness. The Police Magistrate stated that sections 91 and 92 of the act gave the bench power to inflict a penalty of £50, and also to suspend or forfeit the license, but they had some doubt as to whether they could enforce such a stringent regulation in that case because the information laid under section 92 did not set out the pro visions’ of section 94. Had it been so they would not have had the discretionary power which they had under the circumstances. The defendant would get the benefit of the doubt, and he hoped he would not again break the law. He was fined £10 and costs. –Charles Clark and Robert D. Sims, who were charged with having been on the premises mentioned at that hour, they not being lodgers or inmates thereof, admitted the charge, and were each fined 35s and costs. PERMISSION TO SELL.–W. 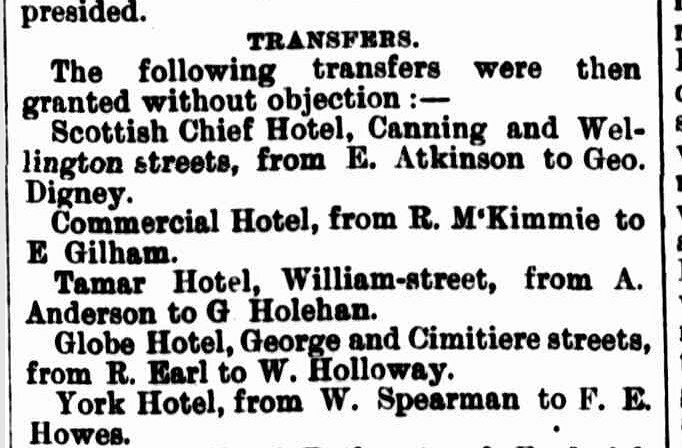 S.. Bassett was granted permission to sell liquor at the Tamar Hotel, William-street, under the license held in the name of Edward Holehan, until the next meeting of the licensing bench. Michael Tierney was granted permission to sell liquors at the Tamar Hotel until the next meeting of the Licensing Bench, under the license held by Vincent Warrington. Police Court.-At the Police Court on Saturday morning, before Messrs. E. Whitfeld, P.M., and J. Stephenson, J.P., William Douglas Burns was granted permission to sell liquors under the license held by Michael Tierney, of the Tamar Hotel, until the next meeting of the Licensing Bench. This entry was posted in Hotel, William Street and tagged location, photo by Xenith. Bookmark the permalink.